Employee record-keeping just got easy! Much easier than herding cats! At a time when it’s imperative to keep organized, consistent, and accurate records on all employees, HR File Builder (formerly Employee File Builder) can provide you with the best possible documentation. In the event employment or legal problems develop, you can be confident having the necessary records and documentation to back you up. Whether you have 5 employees or 500, managing employee records can easily get out of hand. Now with HR File Builder, the most comprehensive software for tracking employee information, you can save time, eliminate paperwork, and keep better records at the same time. With employee records kept in one centralized system, multiple authorized users can gain instant access to the information they need, when they need it. Here is the simplest way to set up, maintain, and update human resources files on your employees. User-friendly, centralized system with easy-to-use file folder design allows instant access for all authorized users. HR File Builder with intuitive “file folder design” enables managers to organize and update records automatically with the click of their mouse. An employee photo in each file personalizes the system and provides instant recognition. You have all critical records such as work and salary history, time-off, benefits, training, and performance trends at your fingertips. Plus the “Activity Notes” screen enables you to make a notation once, but the information will also be reflected in all reports, spreadsheets and overviews. Make changes directly on your screen — it’s easy to quickly sort, manipulate and update information. HR File Builder’s built-in wizards help you to set up work policies and assign benefits quickly and easily. Cut and paste employee information directly into Microsoft Word or Excel documents. There’s even an automatic spell checker on all comment and note fields. “Keep Tabs on Personnel Files” The information you need about your employees extends far beyond a list of whom to call in an emergency. With Employee File Builder from JIAN, it’s easy to create and update a complete file on each of your employees. I liked working in the tabbed interface, which organizes employee information into customizable topics like Employees, Corporate Views and Company Policy. Buttons specific to each section appear along the right side of the screen. During setup, I defined 36 user fields for specific information, such as hobbies, special needs or security check requirements, choosing text, numbers, date, currency or Yes/No as field types. The program offers a lot of visual assistance, from a timesheet—like attendance chart to a variety of standard bar and pie graphs that allow you to filter which employees the program reports on. Using the built-in Crystal Reports engine, I could request more than 45 reports, ranging from job history to certifications and training. If you have Crystal Reports on your system, you can modify the layouts. 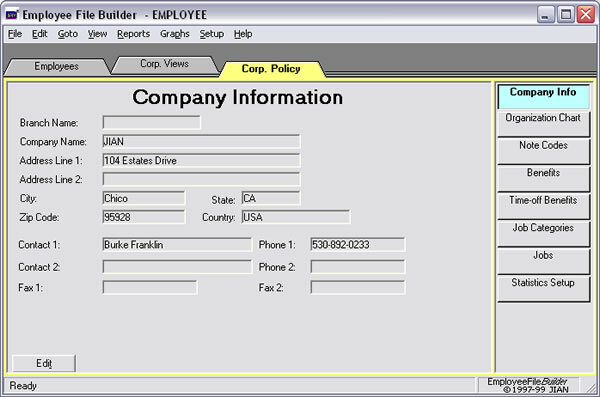 Employee File Builder also supports printing labels on nine different Avery forms. The program lets you import from dBASE, Access, Paradox and FoxPro, but not from comma-separated or tab-delimited files. You can also change the background color as well as colors for file folders in use — a nice touch if you spend a lot of time working with employee files. 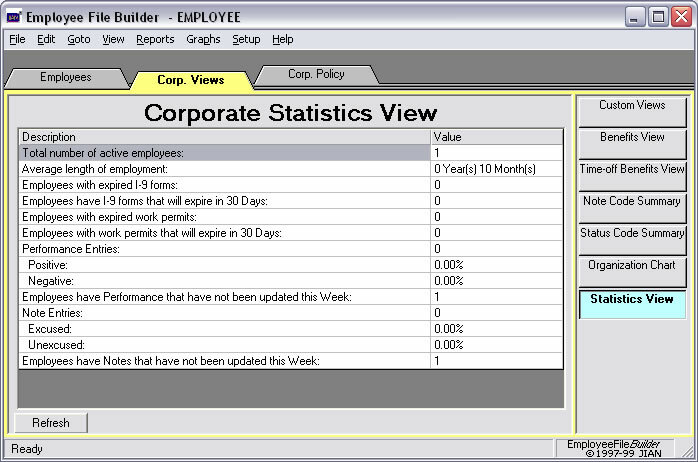 Employee File Builder makes it easy to keep track of the complex array of employee data.